Here's or second music-related story of the day, but this one is a far cry from enka singing. Word from Nippon Cinema about a really interesting looking documentary directed by Tatsuya Ota that chronicles the roots of punk rock in Japan by spotlighting the rise and fall of one of its earliest acts. 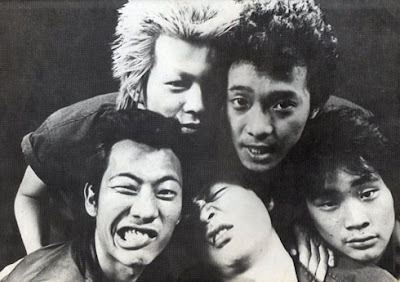 Although they didn't have a very punk rock beginning, (they formed in 1979 for a band competition sponsored by Yamaha) they went onto huge success, selling 13 million copies of their debut album "Invitation". Compiled from original footage of the band along with current interviews with its members "Anarchy" looks like it would be perfect viewing for fans of, say, Sogo Ishii's 1982 punk rock classic "Burst City". sadly the DVD of "Anarchy" that is set for release in Japan on February 4th will not include English subtitles. Follow the link above to watch the trailer for "Anarchy" and then check out the video of the band in a 1981 lightning fast performance of the Chuck Berry classic "Johnny B. Goode". Just to correct one info, their first album was ''アナーキー'' (Anarchy), and it was produced by INVITATION label of Victor Enetertainment. there isn't album Invitation, it's label which released 1st album.